Shelves, bookcases or cabinets away from sunlight. Glass jars with a tight sealed lid. Label maker, index cards or tape to make labels. Spoons to scoop out and transfer your herbs. These are the basics for storing your herbs before you start studying them or creating with them. It's important to have a safe and livable home for your herbs because any amount of sunlight, air or moisture could damage already dried herbs. I would also get used to saving all of the jars you find around your house, markets or family pantries as storage will always be needed for your herbs and creations. Yes, herbalism is a fancy word for hoarder. Just kidding. Any time you decide to transfer your purchased herbs into a jar, or you have made a creation, it's important to label everything. Label the contents of the jar, the date you put your contents in the jar, and when they will expire. Sometimes, you will also want to put a date on when your creations will be available to you, as sometimes when making elixirs of any, they have to be stored for "x" amount of time, before you can use them. We will get more into this at a later time. After you have your basic tools, and you have chosen a trusted seller to get your herbal products from, you are probably feeling extremely overwhelmed with all of the herbs you are seeing that you should purchase. I can see you now.. you are looking at Ashwagandha Powder, Anika Flowers, Brahmi, Kava Kava Root and you are going cross eyed because you have no idea what they are, what you do with them, how they can be beneficial to you and you're about ready to walk away. Let me stop you right there! We are starting out with the basics remember? Oh yes! These items are just what I would recommend when starting out, but you are welcome to pick anything that you might be more familiar with that is not on this list (this is all about you). I would choose no more than 5 herbs to start with before expanding your collection. If you are feeling up to a little bit of a challenge, I encourage you to choose at least one herb that you are not familiar with, but that is completely optional! When you receive your herbs, don't forget to transfer them to jars and label them. You will thank yourself in the long run for labeling because once you add another 5-10 herbs to your collection, sometimes they all start to blend in with one another and you will not be sure what you have. Pro Tip: Keep a journal or checklist of all the items you have, and items you want, and check them off as you grow your practice. Okay, you are doing great so far! You have your herbs, you have stored them properly, labeled them and now you are ready to dive deeper. I can probably guess that you atleast put Lavender in your must have start-off list. Am I right? I highly encourage you to also visit more of my herbal education posts, and also do online research to just learn even more about each and every herb or spice that you got before you decide to create with it. Books are also helpful! When creating teas, tinctures, balms..etc, you will only want to use the herbs that are focused with why you are making that specific product. 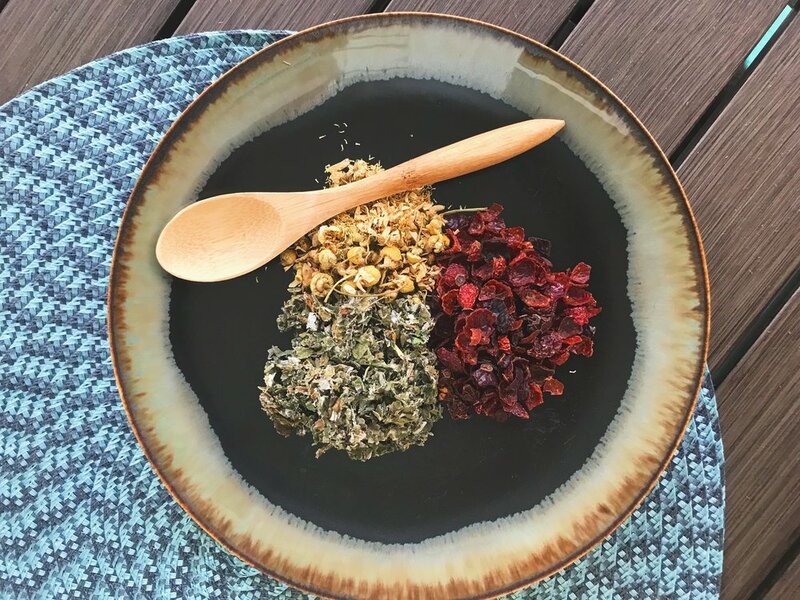 If you are looking to make a calming tea, you are only going to want to use herbs that having calming qualities, and not herbs that have more of a caffeinated property about them. It would defeat the purpose! Just like if you were wanting to create a balm for dry hands, you would want to use herbs that have moisturizing properties. So-on and so-forth! After you have learned more about your precious herbs and spices, I want you to start with a very basic and a very traditional method in using/taking in your herbs. Tea! I bet you didn't guess that? We are all used to having a tea bag pre-filled with herbs, but there can be pro's and cons to that because most commercial companies who create herb filled tea-bags have fillers that are not the best for our bodies. I recommend getting your own tea bags to fill with your own herbs if you wish, but I also want you to find other ways to steep your tea like using a kettle, mesh strainer, tea straw, cheesecloth or metal strainers. I prefer this method because you can see your herbs being soaked in the water. There is something quite meditative and healing about watching your herbs dance around in the steaming hot water, creating you a delicious and healthy treat. Be sure that when steeping your tea, you throw a cloth or lid over your vessel because you don't want steam to escape until you are ready to consume.